Can you get a battery charger for a conversion that will work with commercial EV car chargers currently being installed throughout the country? Look for the SAE J1772 EV interface in a 220v charger - pretty much standard for EV chargers - or else the charger will just use a regular 110v plug. Either of those will plug into a commercial charging station. "Most EV conversions will do both voltages, 110 and 220. 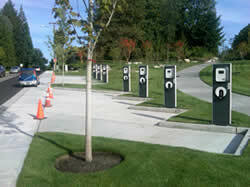 Most of the charging stations I list on Plug In Olympia have both 110 (L1) and 220 (L2) voltages. The station in the picture above is typical and has both." Return to Battery Charger Q&A.